Join us for FTC 2016, the world's pre-eminent forum for reporting technological breakthroughs in the areas of Computing, Artificial Intelligence, Data Science, Robotics, Communications, and Internet of Things. FTC attracts researchers, scientists and technologists from some of the top companies, universities, research firms and government agencies from around the world. Join us for FTC 2016, the world's pre-eminent forum for reporting technological breakthroughs in the areas of Computing, Artificial Intelligence, Security, Robotics, Electronics and Communications. Click here for conference topics. The conference is predicated on the successful conferences by The Science and Information (SAI) Organization that have been held in the UK since 2013. 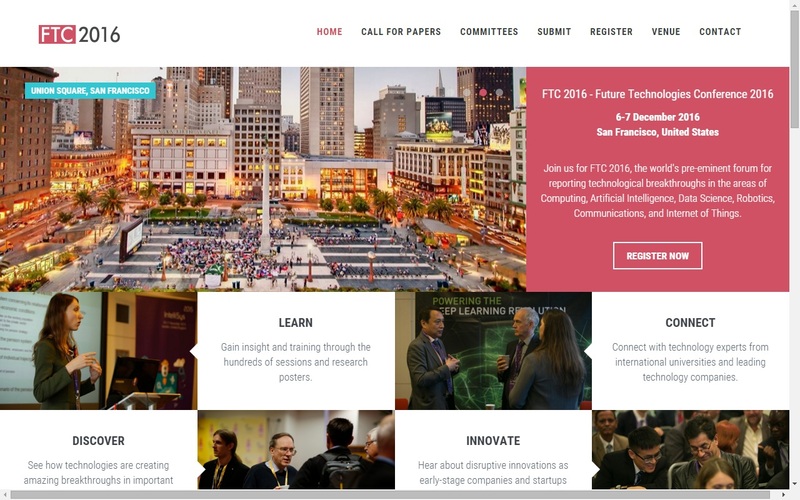 FTC 2016 combines a stimulating technical program with an exciting new venue, San Francisco, a city renowned for its steep rolling hills, eclectic mix of architecture, and landmarks including the Golden Gate Bridge and cable cars. Papers are accepted either through the online submission tool or email at FTC@SAIConference.com. For those unable to use the Online System and are emailing, please include a cover letter with author details, university or country information, and any other author related data. Springer Book Series - Studies in Computational Intelligence, Indexed by DBLP, Ulrichs, SCOPUS, MathSciNet, Current Mathematical Publications, Mathematical Reviews, Zentralblatt Math: MetaPress and Springerlink.